A chocolate pudding is always scrumptious. These desserts are both simple to make and delicious to eat and because chocolate can lose some of its flavour when chilled, they are specially designed to be full of flavours that bring out the full taste of the chocolate. This recipe serves four and is easy to make, but has a sophisticated flavour that belies its simplicity. Preheat the oven to 200C or gas mark 6. Melt the butter in a microwave and then use it to butter an ovenproof dish and the cut sides of the peaches which you then set in the dish, cut sides up. In a small bowl, stir, together the remaining ingredients, then divide between the centre of each peach. Put on a middle shelf in the oven for around twenty minutes. Allow to cool for five minutes then transfer to serving bowls and allow to cool completely before serving with fresh cream. 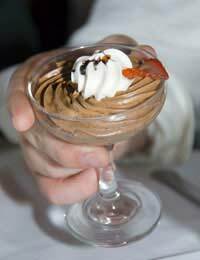 This decadent version of classic chocolate mousse serves six. 1 tablespoon cold coffee or coffee essence. Melt the chocolate in a saucepan over boiling water or in a microwave, then stir in the coffee and brandy. Take off the heat. In another bowl, whisk egg yolks with the white sugar until pale, before adding to the melted chocolate and mixing well. In a large bowl whisk the egg whites until soft, then continue to whisk, gently adding the brown sugar until a stiff mixture that peaks easily is achieved. Finally, whip the cream to the light peak stage and then fold it into the chocolate mixture, followed by the egg white mixture, folding in gently using a large metal spoon and a figure of eight movement. As soon as the mixtures are blended pour into serving glasses and put in the fridge for at least thirty minutes. Warm a frying pan and then pour in the sugar and the cherries – shake gently until the sugar begins to dissolve. Add the brandy and flame, taking care not to shake the pan so the burning alcohol spills out. When the flame dies out, add the red wine – keeping back two tablespoons - and the cinnamon and bring the whole mixture to a simmer. Dissolve the corn flour in the reserved wine and pour into the simmering mixture, stirring with a wooden spoon so that it thickens without going lumpy. When ready to serve, take the pudding from the refrigerator and pour the hot sauce over it. This rich dessert serves eight. Preheat the oven to 200C or Gas 6. Roll out the pastry to fit a 25 cm tart tin. Cover the base with greaseproof and weight down with rice or baking beans. Put on a baking sheet and then put in the oven to cook for fifteen minutes before removing the rice/beans and the greaseproof paper and returning to the oven for a further fifteen minutes. Take out of the oven and allow to cool. Reduce the oven temperature to 175C or Gas 4. Whisk the six eggs together, add the sugar, golden syrup and melted butter and stir well. Chop 225 grams pecans and add to the egg mixture with the white chocolate. Fold together gently. The mixture looks very liquid but don’t worry, it firms up very swiftly in the oven. Pour this mixture into the tart case and top with the remaining pecans – put back in the oven and cook for 40-50 minutes until the filling sets.